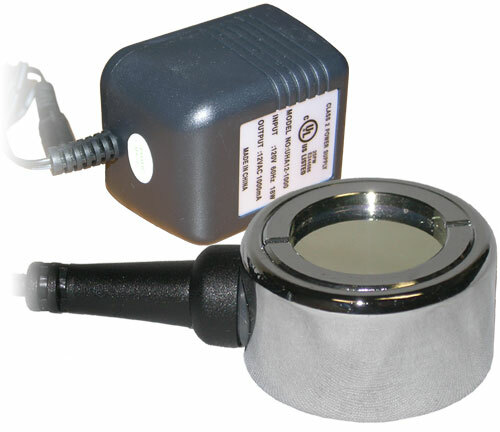 Available in single and sets of three power beam kits. Power Beam will help you add nighttime beauty to your decorative pond, fountain, plants, or landscaping. Available with transformer and without! 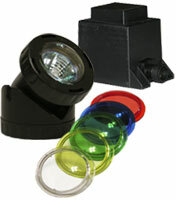 Four colored lenses in red, blue, green, and yellow are included for each light! 20 watt must be used wet only! Comes with a 2 year warranty! 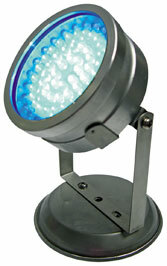 Powerful 20-watt halogen bulb will highlight your water garden at night. Includes set of four color lenses: red, blue, green, and amber. Comes with stand that lets you adjust the angle of the light. 20 watt / 12 Volt. 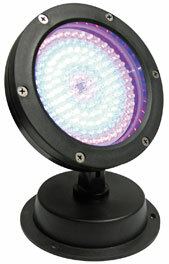 144-super bright changing LED pond light (red, blue, & white) with inline, waterproof controller for color-changing. 8 watts; PVC housing. 33’ cord. Energy efficient. Last 10 times longer than conventional lighting and consumes only a fraction of power over halogen lights. Equipped with super bright LEDs and high quality housing. Use OUT of water. Great for fountains, ponds, lakes, waterfalls, or garden landscapes. TWO year manufacturer warranty. Low Voltage. Energy Saving. 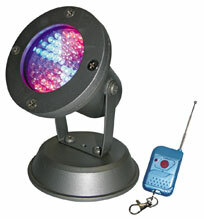 60-super bright changing LED pond light (red, blue, & green) with wireless controller for color-changing. 4.5 watts; aluminum housing. 33’ cord. Energy efficient. Last 10 times longer than conventional lighting and consumes only a fraction of power over halogen lights. Equipped with super bright LEDs and high quality housing. Use IN or OUT of water. Great for fountains, ponds, lakes, waterfalls, or garden landscapes. TWO year manufacturer warranty. Low Voltage. Energy Saving. 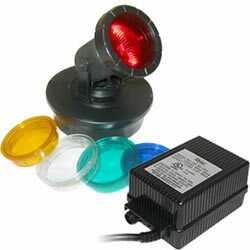 72-super bright changing LED pond light (red, white, & green) with inline, waterproof controller for colorchanging. 5 watts; aluminum housing. 33’ cord. Energy efficient. Last 10 times longer than conventional lighting and consumes only a fraction of power over halogen lights. Equipped with super bright LEDs and high quality housing. Use IN or OUT of water. Great for fountains, ponds, lakes, waterfalls, or garden landscapes. TWO year manufacturer warranty. Low Voltage. Energy Saving. 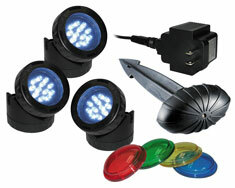 Set of three 12-super bright white LED pond lights with photo cell, 3 stakes, transformer, and twelve color lenses. 9.6 watts; PVC housing. 23’ cord (5’ cord between lights).Energy efficient. Last 10 times longer than conventional lighting and consumes only a fraction of power over halogen lights. Equipped with super bright LEDs and high quality housing. Use IN or OUT of water. Great for fountains, ponds, lakes, waterfalls, or garden landscapes. TWO year manufacturer warranty. Low Voltage. Energy Saving. 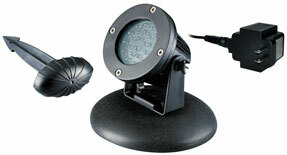 36-super bright white LED pond light with photo cell and transformer. 4.8 watts; aluminum housing. 23’ cord. Energy efficient. Last 10 times longer than conventional lighting and consumes only a fraction of power over halogen lights. Equipped with super bright LEDs and high quality housing. Use IN or OUT of water. Great for fountains, ponds, lakes, waterfalls, or garden landscapes. TWO year manufacturer warranty. Low Voltage. Energy Saving. 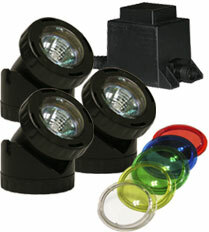 Low voltage submersible fountain light kit and replacement lights available. 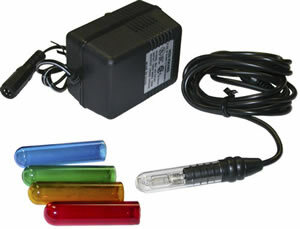 5-watt submersible halogen light includes transformer and four color lenses. One-year limited guarantee. Powerful 50-watt halogen bulb will highlight your garden pond or landscaping at night. Includes stand and stick that lets you adjust the angle of the light. 50 watt - 12 Volt. Must be used with a transformer -not included. 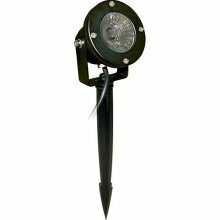 Designed to add to your existing landscaping lighting system. Durable aluminum housing includes stick and stand for easy positioning. Includes 33 FT core low voltage 12 volts. Can be used in or out of the water.